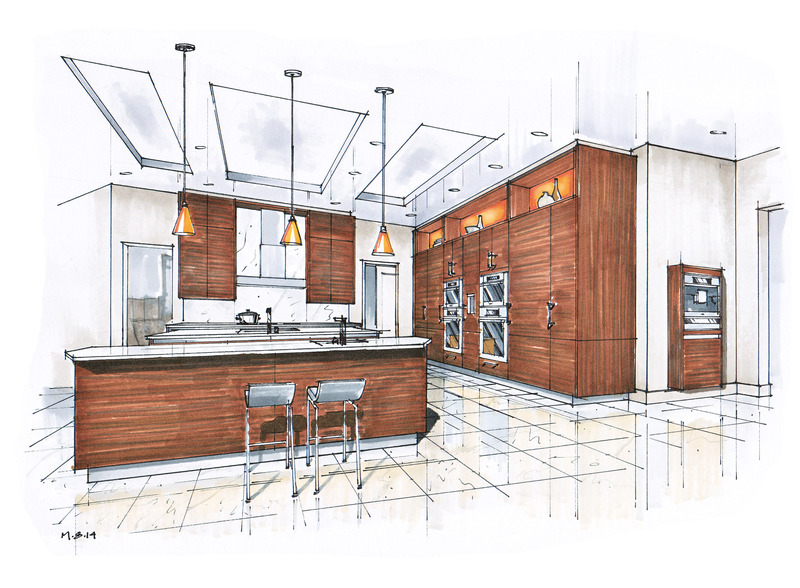 This first project is for a large home with the kitchen space centered within a sprawling floor plan. There are numerous entrances and reveals to other spaces from all sides, which presents a challenge to circulation and maintaining a harmonious feel. The space is quite large however, big enough for two very large islands. Behind all those tall cabinet doors is an array of refrigeration. The next project is has similar finishes and back-to-back, they almost feel like they could be the same project from a different angle. 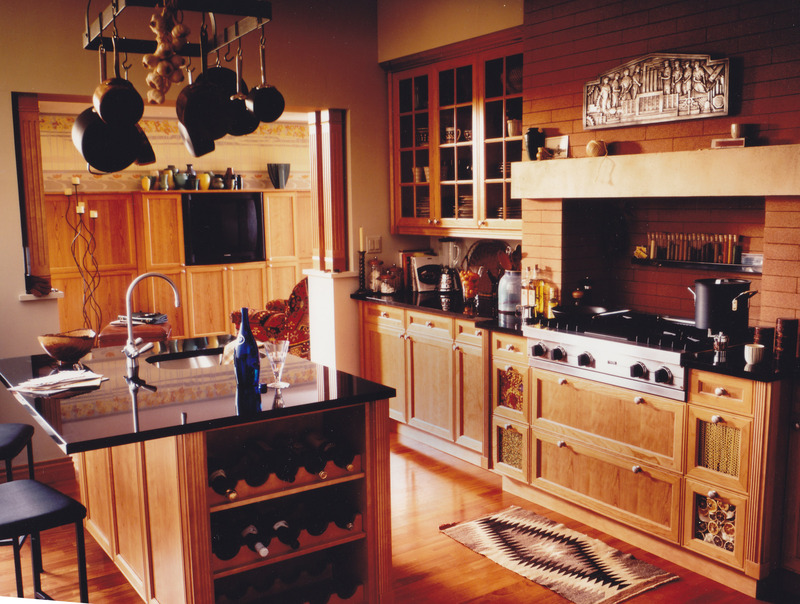 Brown horizontal wood grain has been a popular finish now for about 10 years, with no sign of abatement. 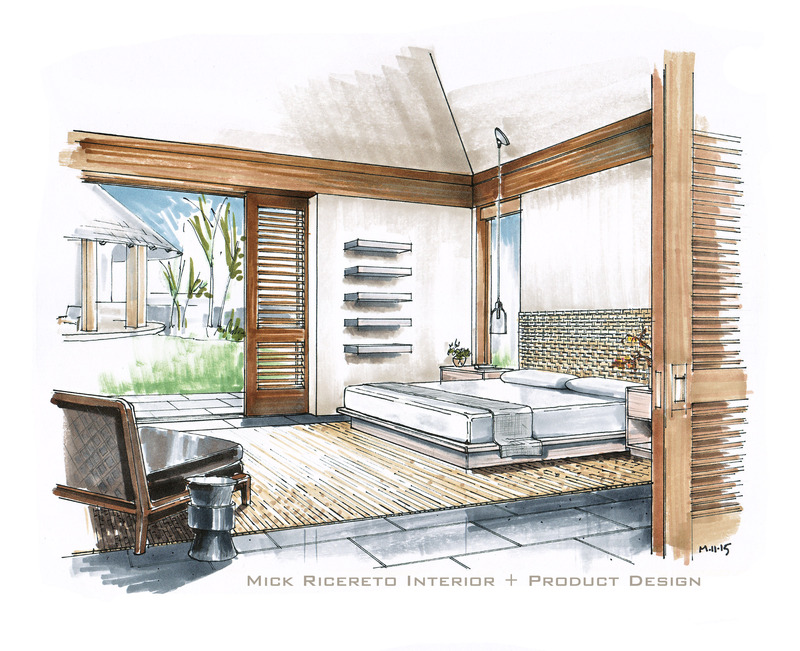 The strong tones work well with the earthy palette many homeowners request. 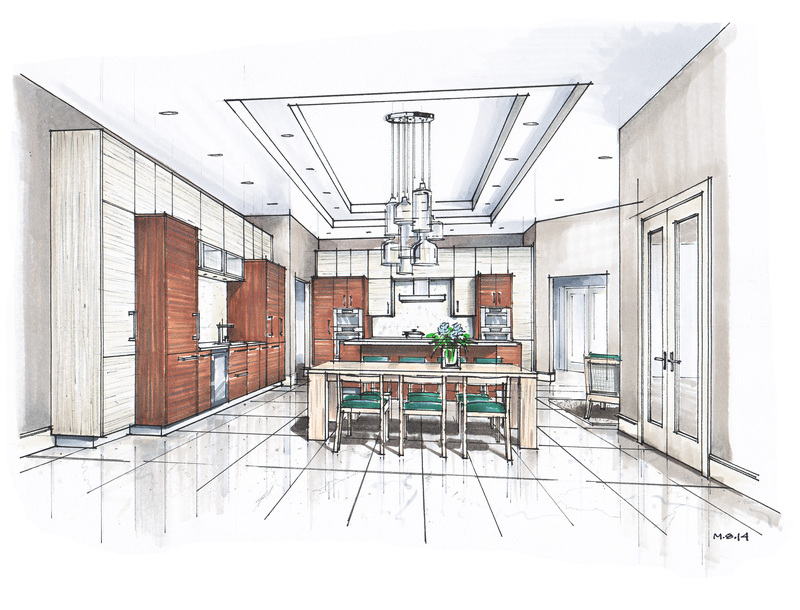 Both of these projects have fairly “traditional” building envelopes, meaning, they have all the trappings of today’s North American building trends like covered porches, traditional-style siding, raised panel doors, big moldings and the like. 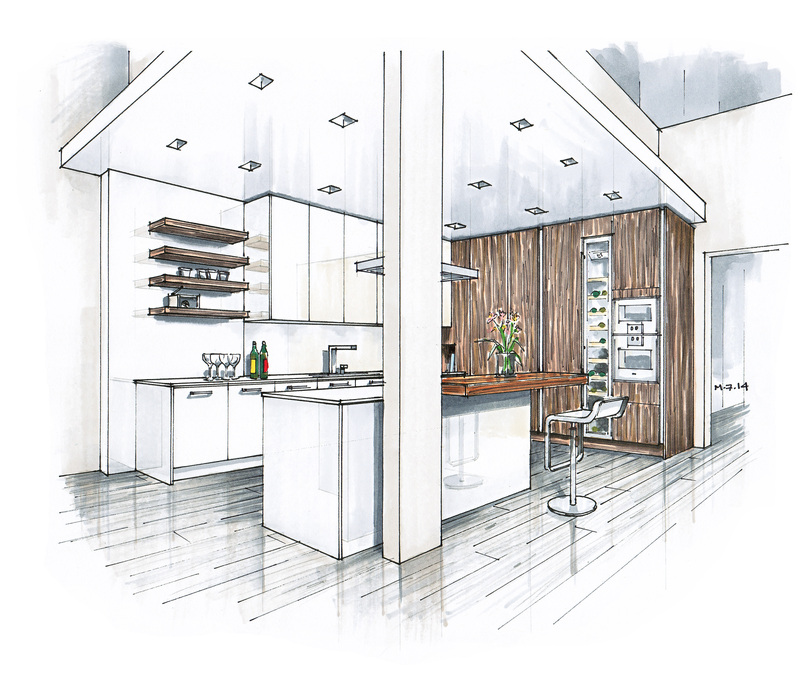 It is good to see functional, modern kitchens being requested in these types of environments, even if there does seem to be a slight clash to the architecture. 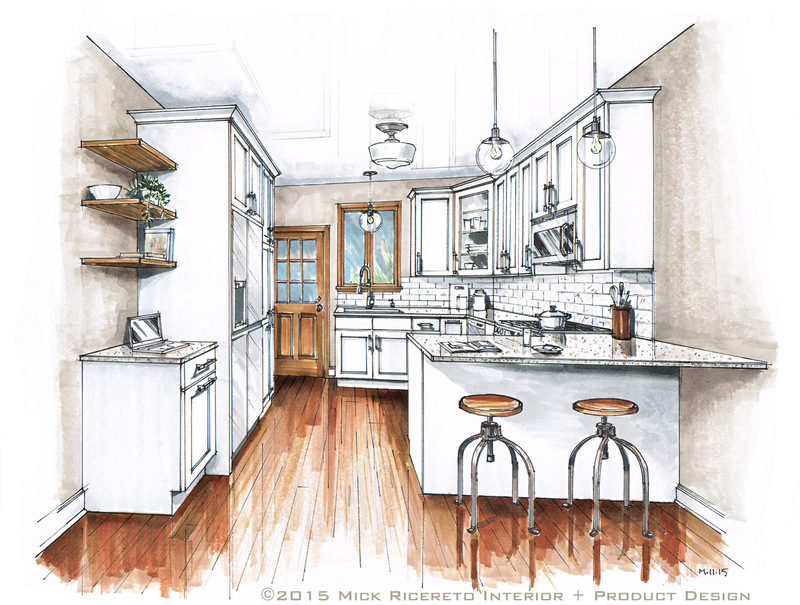 This next project is a small kitchen studio. 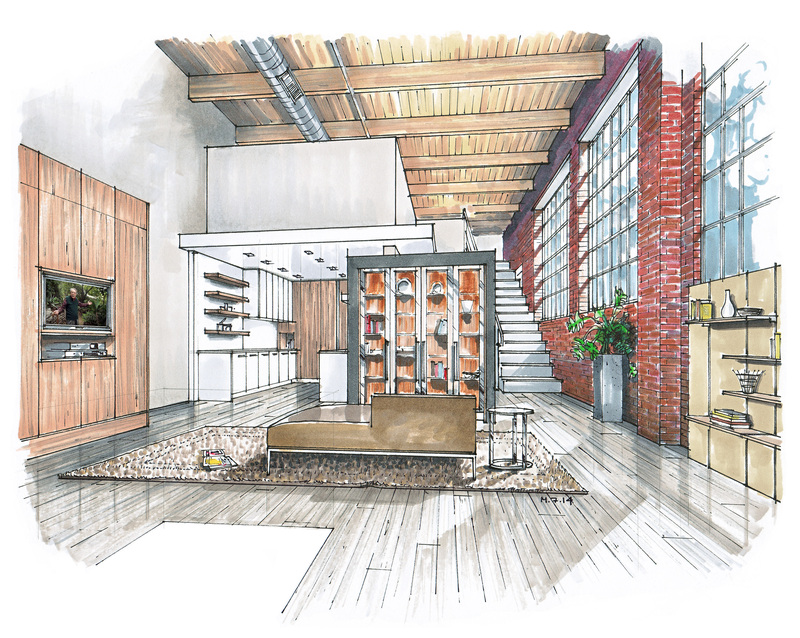 The space is a converted car garage, with an extra high ceiling allowing for a loft space at the rear. 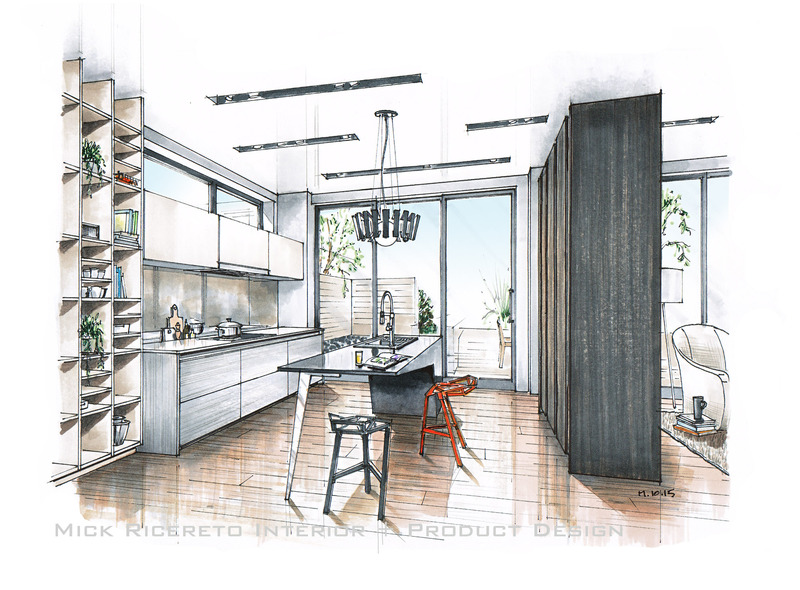 We have planned a large “living environment” similar to the types of spaces we have been designing for large showrooms such as SieMatic New York. 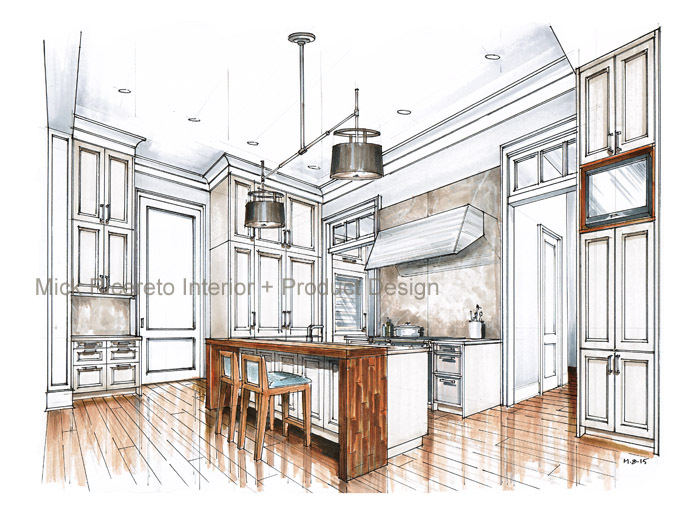 In this case the main space is shared between two kitchens, to highlight different solutions to the same living example. 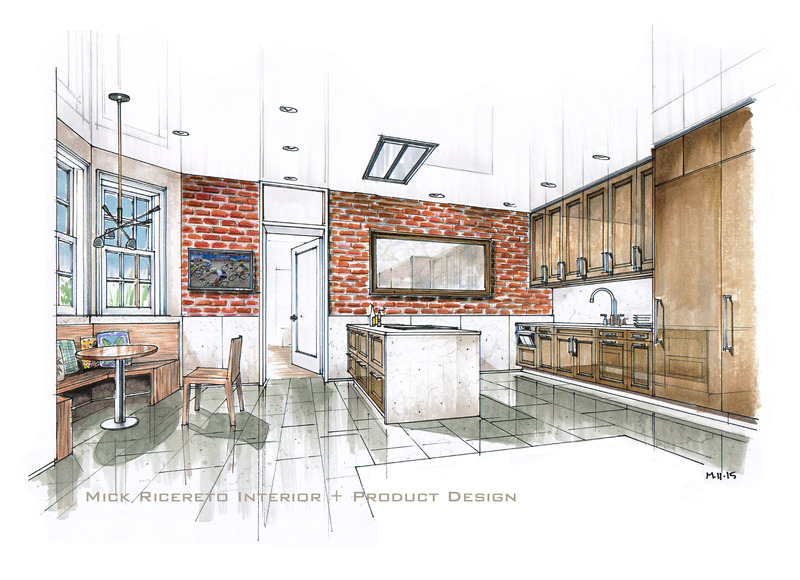 The rear kitchen is functional, and positioned under the loft like it would typically occur in a converted apartment. We kept the cabinet sizes similar and very similar, for an elemental look to counteract the busy, large industrial-type space around it. 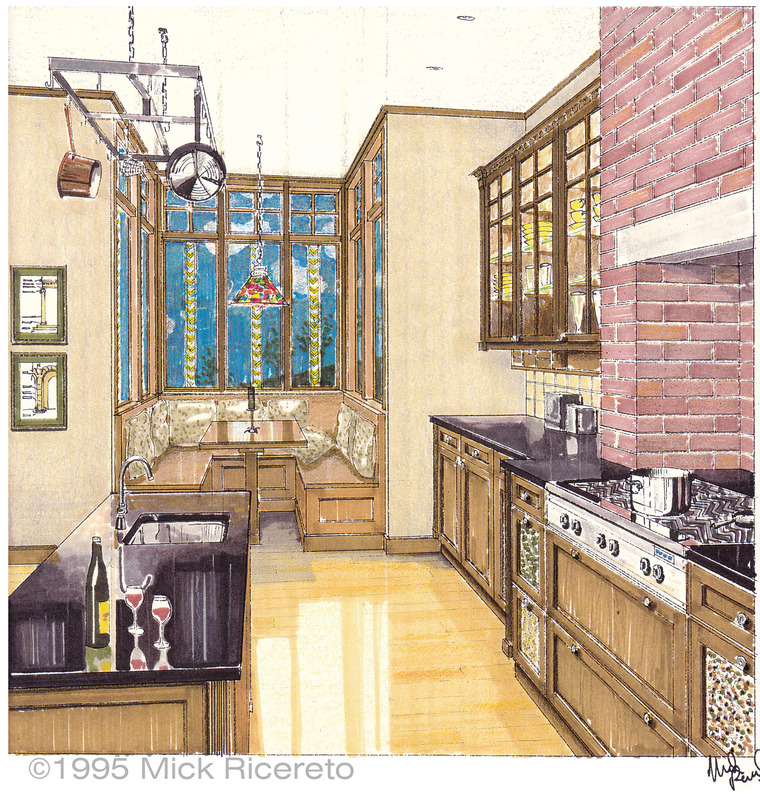 The front kitchen display is completely integrated into the environment and designed to be less “kitcheny” in appearance. 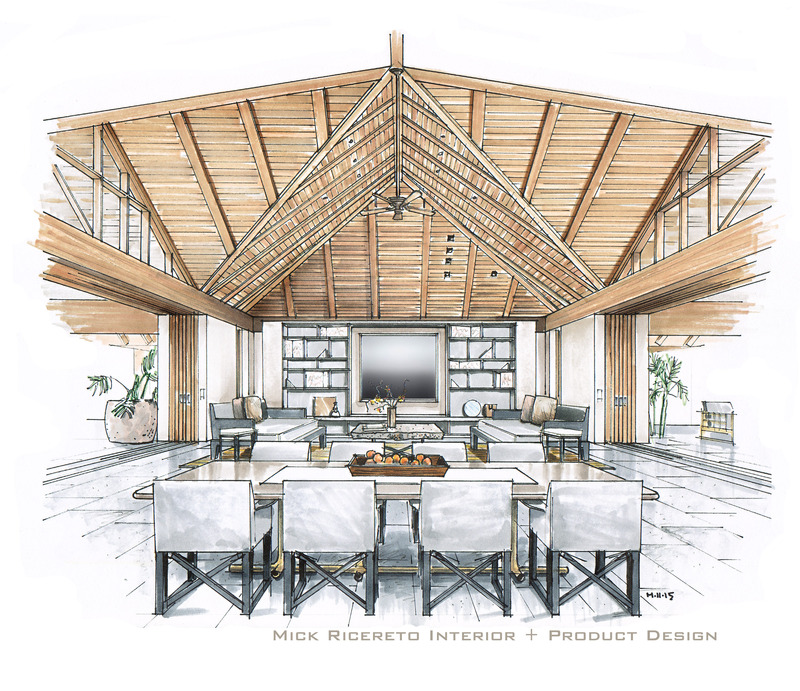 Across from the island is to be a built-in seating element with a long table suitable for parties and for client consultation. 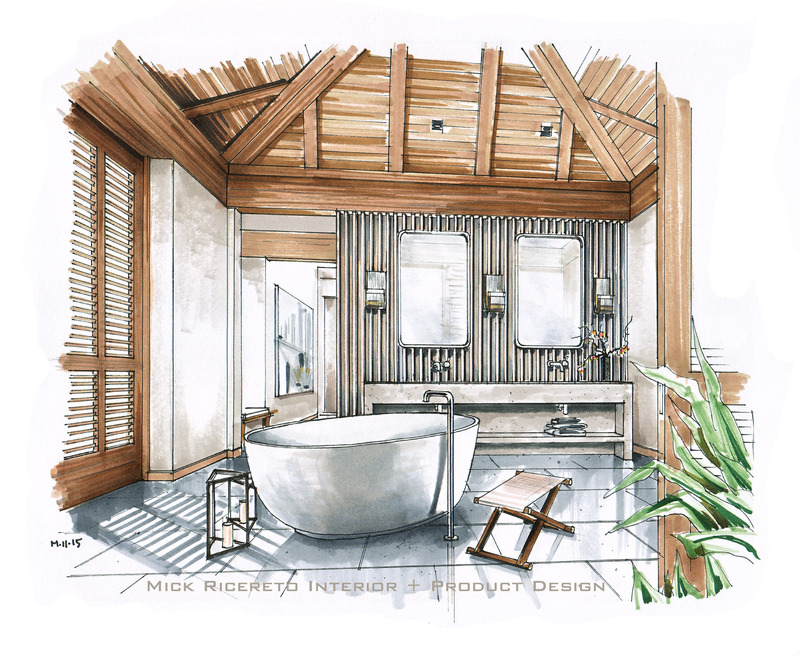 The overall feel is to inspire the visitor and convey a feel of real architecture. I think we will achieve all this with our design solutions. 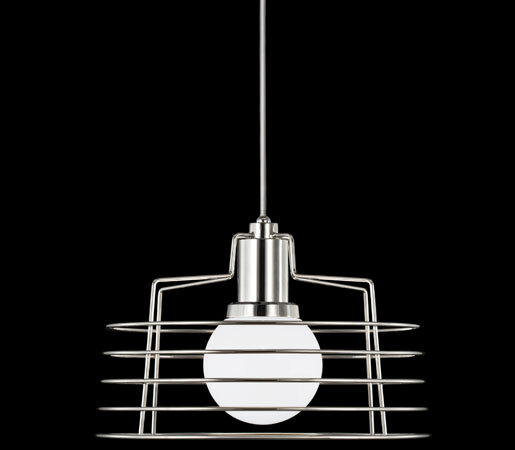 On the Industrial Design side, we have been working on a few lighting collections over the past 12-18 months. We have some models just finishing up and we are now in the process of picking colors. 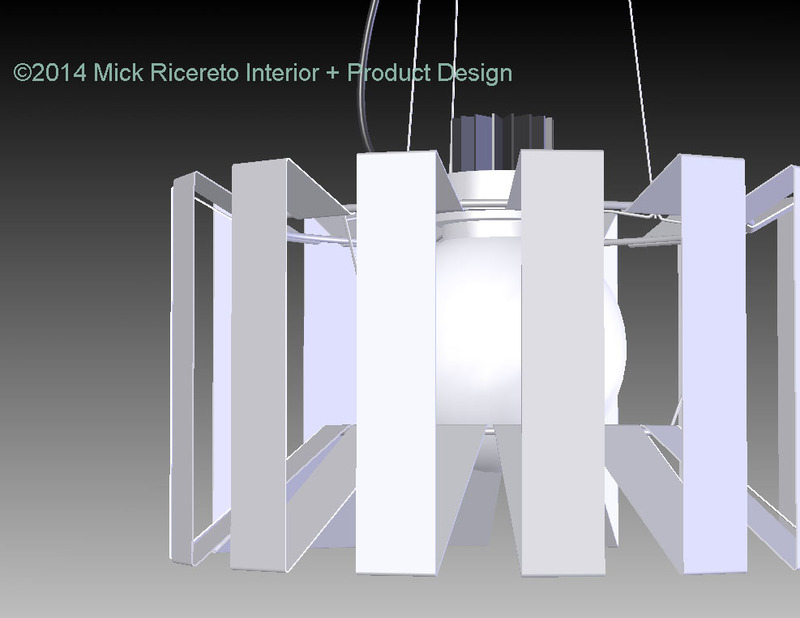 Recently debuted at Wanted DesignNY in May, the Lacage pendant fixture for Ilex Lighting is entering production very soon. We have launch photos in chrome and brushed nickel, but there will be some interesting color options for more pop. Well, summer is almost over and I feel like it hasn’t started because of all the work we have been getting though the studio. The reality is though, time flies when busy and having fun alike. 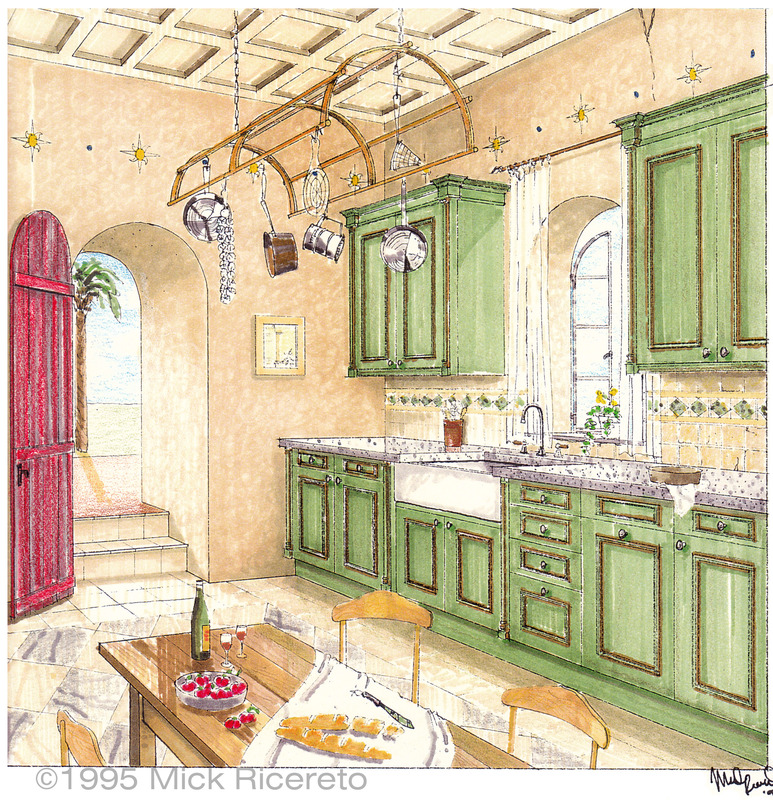 I do look forward to getting our lighting finished and getting the latest news from Europe for next year’s kitchen trends like we do every September. 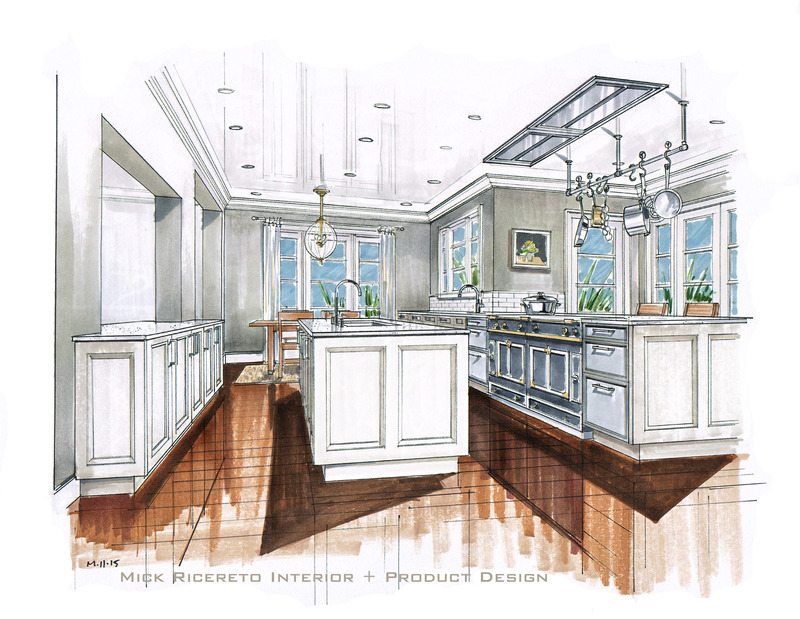 In the mid-2000s I worked as Senior Design Manager for the kitchen hardware company Amerock. During my employ, the venerable manufacturer was in the process of closing their old factory in Rockford, IL and sourcing everything from China and Mexico. I took some pictures of the enormous stamping and diecasting facilities but people were very edgy at the time, with word of closing still not public, so I get less shots than I would have hoped. I did, however, manage to abscond with some old marketing and industrial design relics. I wish I got more. 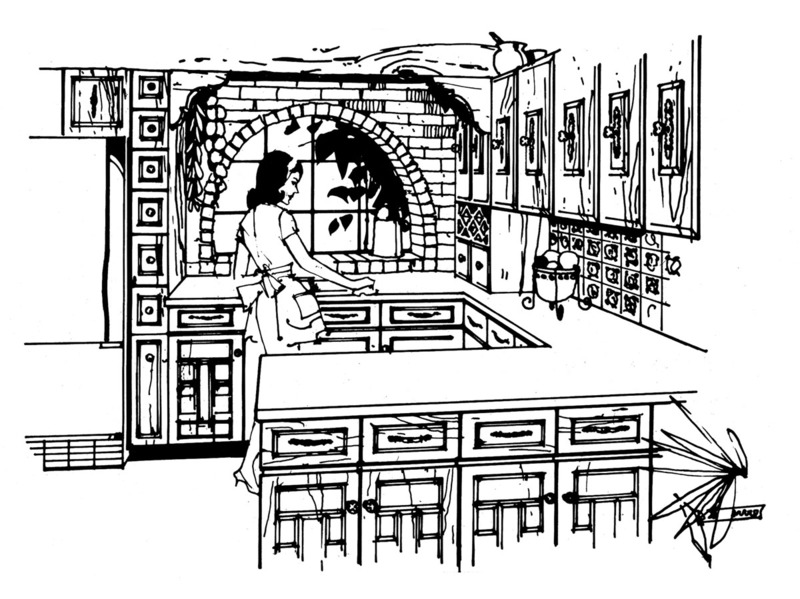 Here is a small sample of catalog kitchen concepts I found in a dusty old folder. These are probably from the 1960s, photos of the original ink on paper with watercolor. The 1960s were the golden age of fashion illustration (nee Mad Men), and illustrators were probably not hard to find like they are today. 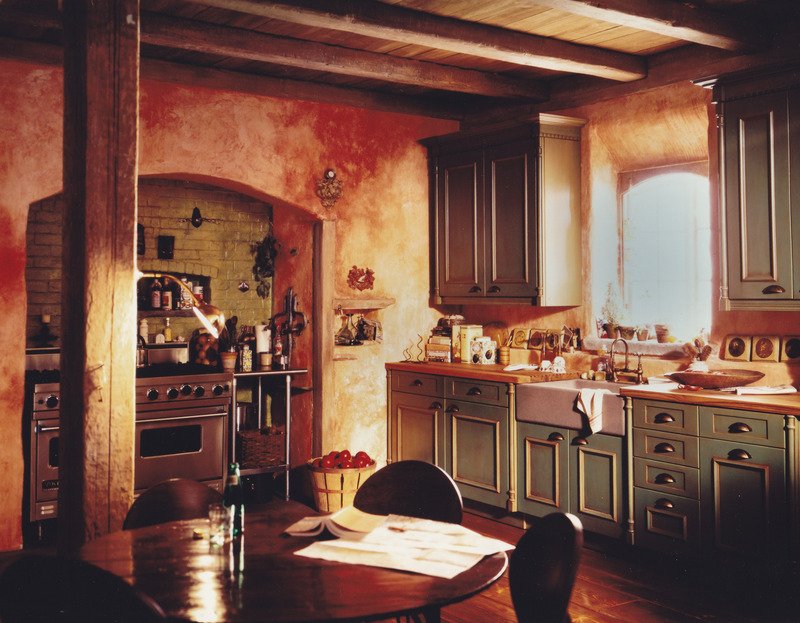 This first kitchen has that old-world feel that was so prevalent at the time. 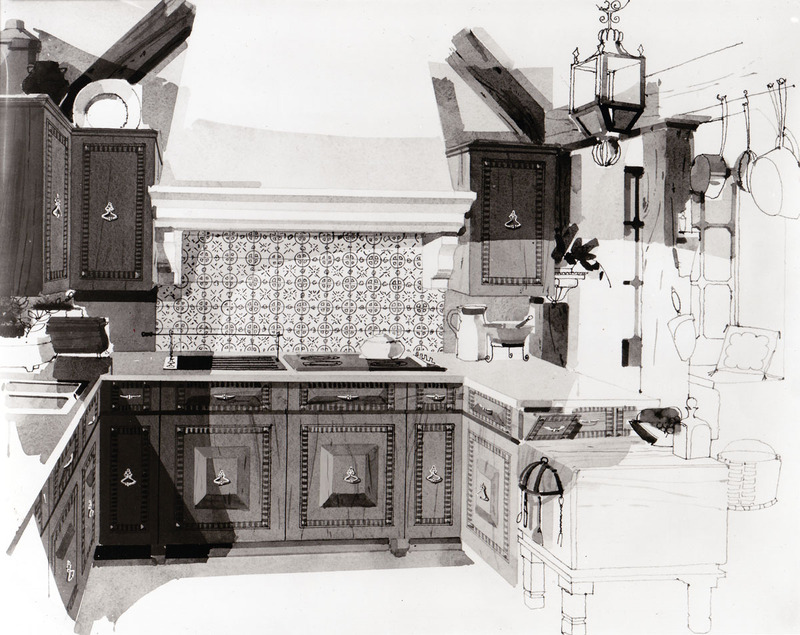 Some of the concepts were just pen and ink. These were probably used as fillers and interludes between the main catalog shots. I love the little housecoat she is wearing. 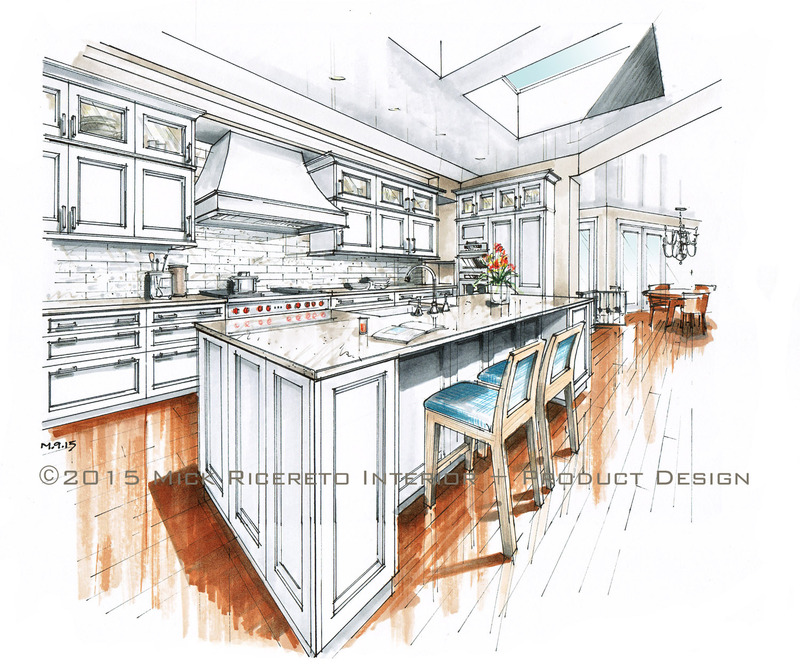 This next was my favorite illustration – very detailed ideas. 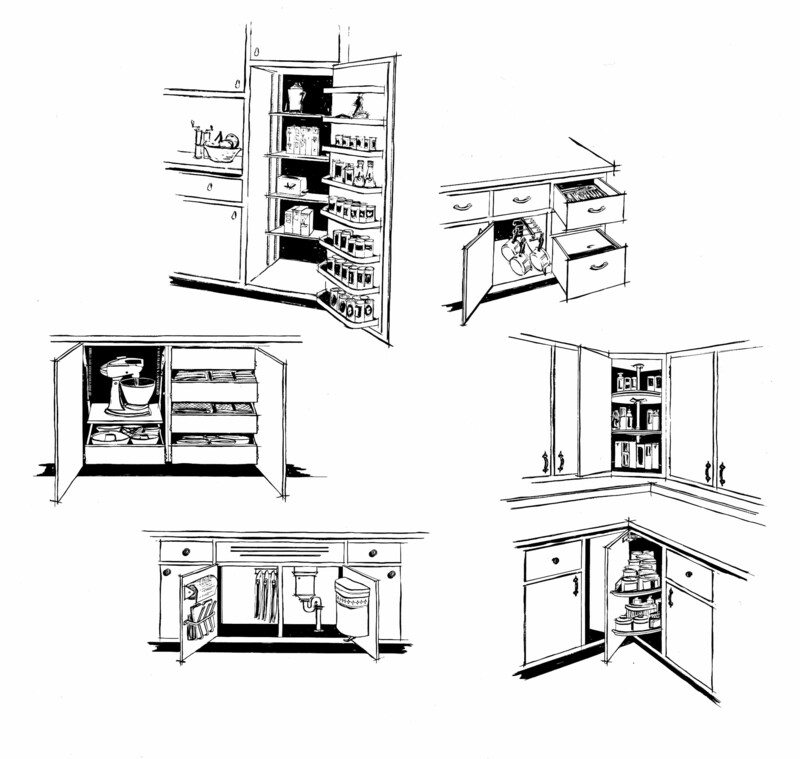 Note how in all of these concepts the hardware is integrated into the design of the cabinets. This was one of the things which frustrated me about working for the company in my era; we only marketed the hardware as objects that would sit in a bin at a big box store and did not try and lead along fashion with adventurous ideas like below. Amerock was instrumental in piecing together the rec rooms us older kids remember from the 60s and 70s. 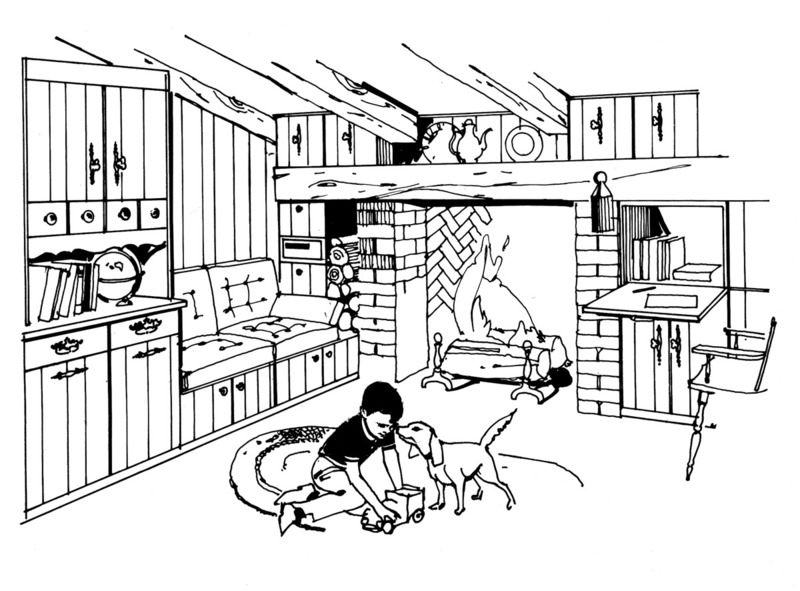 Built-ins were much more common back then, and somebody got to pick from fantasies such as this warm hunting lodge complete with happy child and dog. I really miss the days of built-in seating nooks and fireplaces! In this particular file were small thumbnails of internal storage organizers. 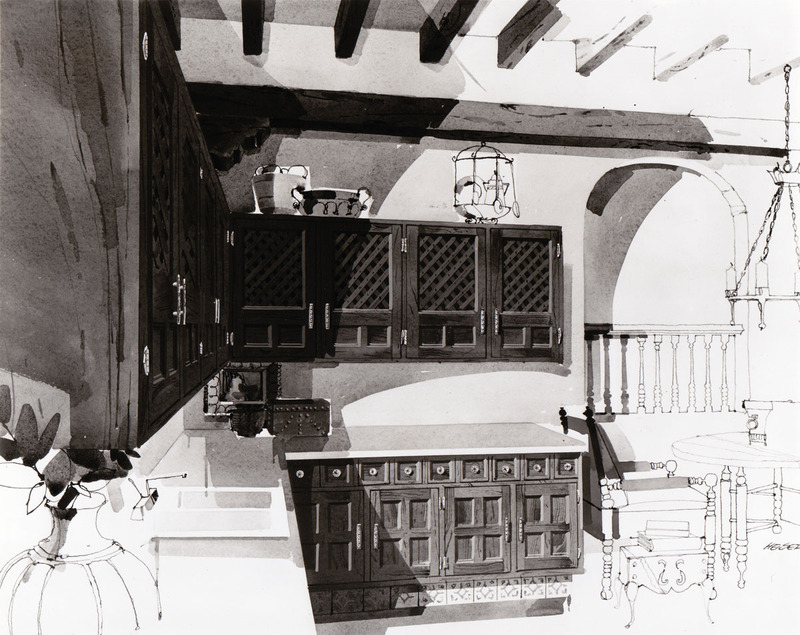 Amerock at one time was involved in all aspects of cabinet fittings, a position which they did not maintain in my era. 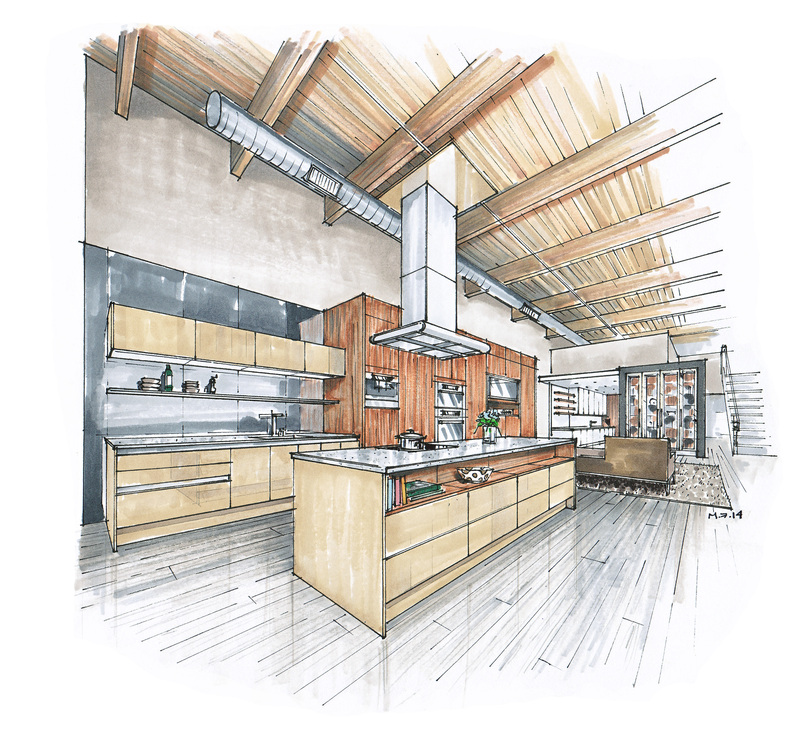 In my practice today, one of the main things I find with kitchen design is the extreme focus homeowners put on internal cabinet organization. 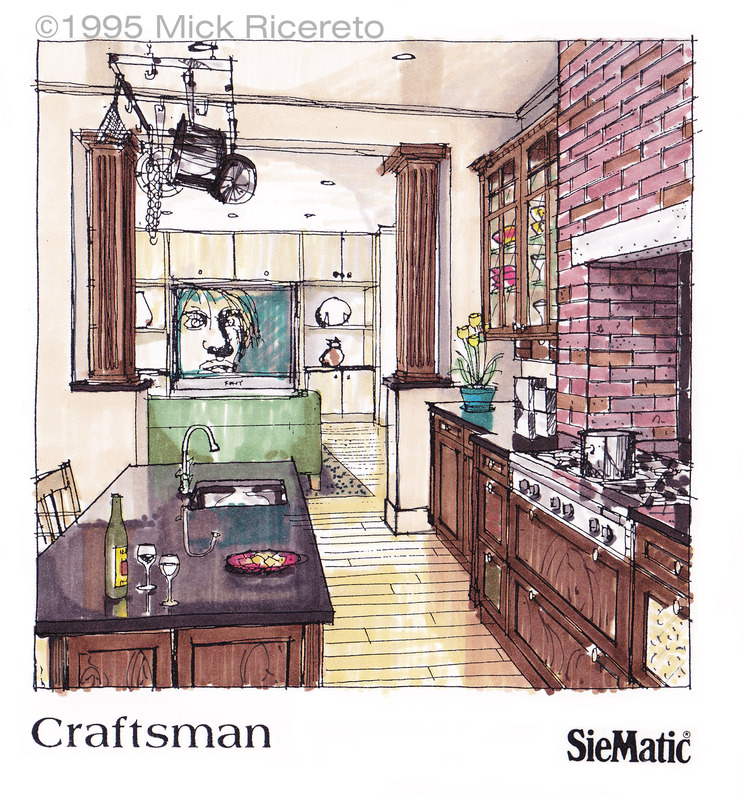 Then again, I focus on European design and interior organization is a strong feature of manufacturers such as SieMatic of Germany. Another watercolor, this one featuring something of an English manor concept. 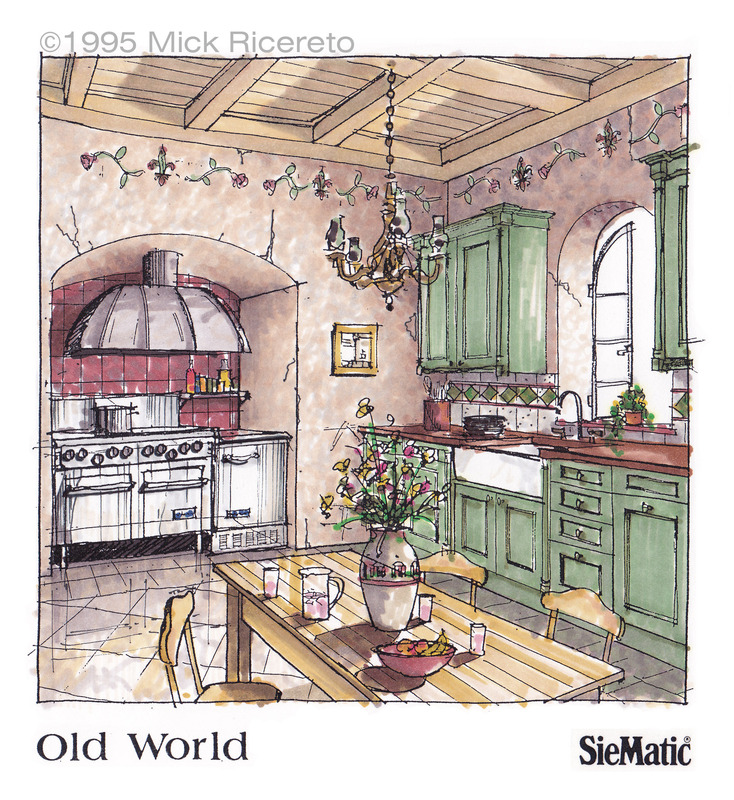 I love how the illustrator left some of the beams without tone, and only just sketching in the table and chairs to balance out the heavy wood. Note that all these illustrations were in grey scale and uncredited; I only have photographic reproductions. I wonder what color might have been used, if any. 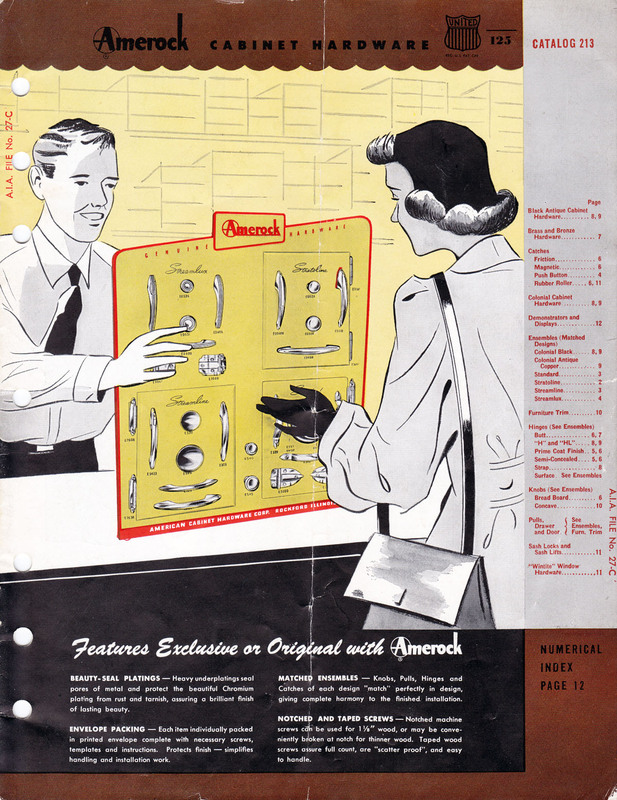 Here is the cover of a catalog dated 1952. A little friendly help from the shop clerk, just like the big box stores of today. 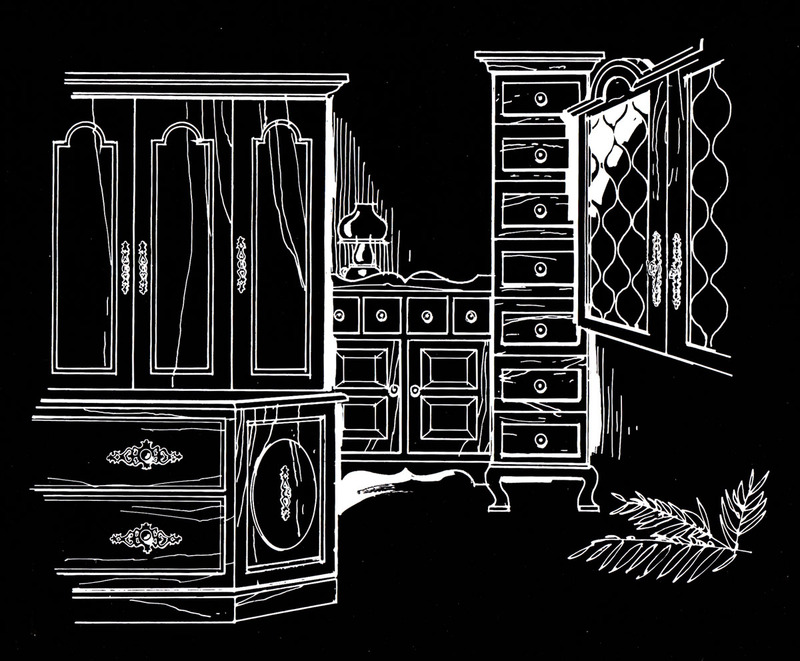 As a parting shot, here is a pastiche of furniture detailing, probably used as a suggestion that “Amerock can be used anywhere you need storage” or some message of the sort. The photo was white on black; I did not reverse it. Cool effect for a catalog. 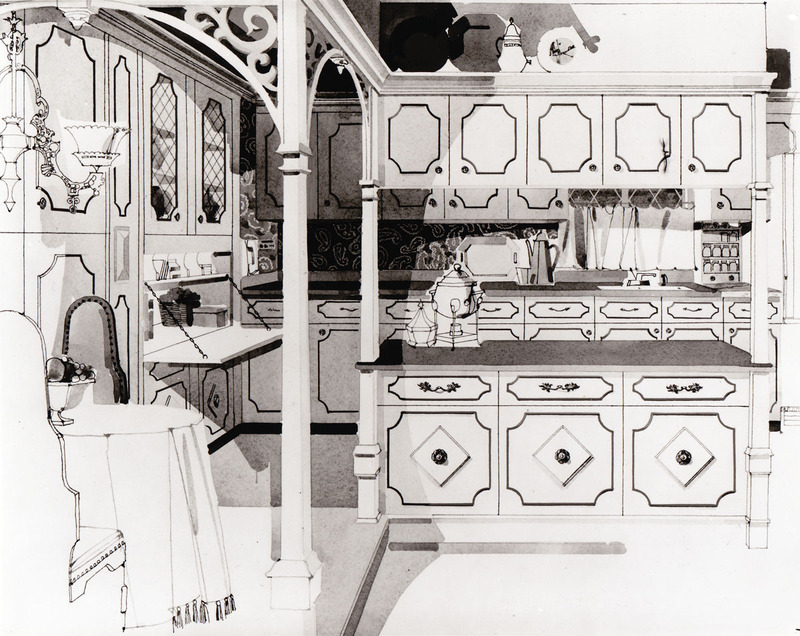 I have more interesting Amerock design archives, including original pencil concept drawings from the 50s and 60s. I’ll take the time to curate and present some old industrial design models too – real full-scale wood carvings of hardware concepts, which are a great contrast to today’s near-instantaneous rapid prototypes.